Statue of Unity (SOU) is the statue of ‘Iron Man of India’, Sardar Vallabhbhai Patel. 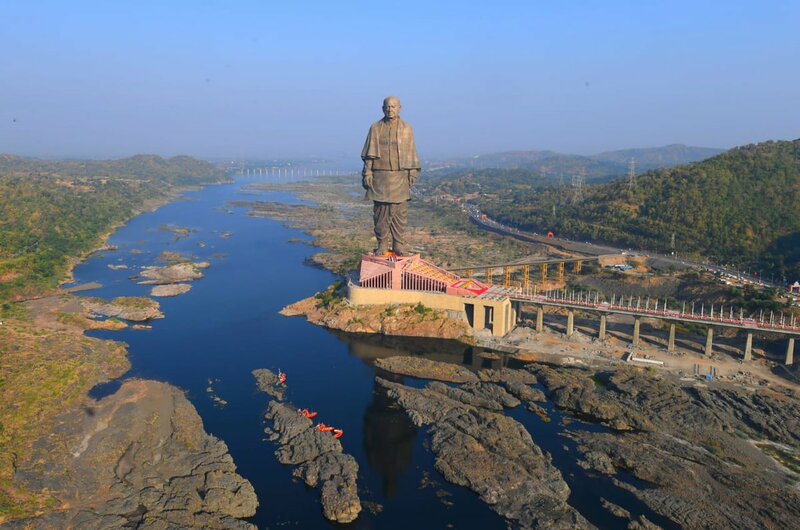 It is the world’s tallest statue in Narmada district, Gujarat state, India. It has a height of 182 meters (597 feet). The total height of the structure including the height of the statue is 240 meters (790 feet). Base of the statue is 58 meters high (190 feet) . It is eructed on a river-island facing the Sardar Sarovar dam alias Narmada Dam. Sardar Patel (31 October 1875 – 15 December 1950) was a freedom fighter and the Deputy Prime Minister of India. He was also the First Minister of Home Affairs. He also served as the First Commander-in-chief of the Indian Armed Forces. This post was abolished and merged with the post of President of India, on his death in 1950. He passed away on the 15th of December, 1950. The statue of unity or SOU is surround by a lake with an area of around 12 square kilometers. The monuments and allied infrastructure occupies an area of 20,000 square meters (220,000 sq. ft.). Larson & Tubro (L & T), a leading Indian multinational company, bagged the contract for design, construction and maintenance of the statue, for a sum of ₹2,989 crore (US$420 million). Construction work was started on the 31st October 2014. The completed statue was dedicated to the Nation on the 31st of October 2018, by Honorable Indian Prime Minister Sri Narendra Modi. 31st of October 2018 was the 143rd birth anniversary of Sardar Patel. There is an Observation deck at 135 meters height. How Do I Go to Sardar Vallabhbhai Patel’s Statue of Unity (SOU)- World’s Tallest Statue? The statue of Unity (SOU) is on an island named Sadhu Bet. It is at a distance of around 3.2 kilometers (2 miles) away Narmada Dam. Rajpipla is the nearest major town to the statue of Vallabhbhai Patel, at around 25 kilometers away. Vadodara (Baroda) railway station is at around 90 kilometers distance from the statue of Patel. Ankleshwar railway station is at around 93 kilometers distance from SOU. Ahmedabad, the capital of the state of Gujarat, is at around 197 kilometers from the statue of Sardar Vallabhbhai Patel. Online tickets to visit the tallest statue one earth can be booked at the website of Sardar Vallabh Patel Rashtriya Ekta Trust. There are separate SOU Tickets for entry and observation deck. If you buy any of these two tickets, then the bus ticket (to travel inside) is free.